Okamoto Kidô's drama "Ogurusu no Chôbê" was published in August 1920 in the magazine Gendai and was premiered in November 1920 at the Meijiza [casting]. 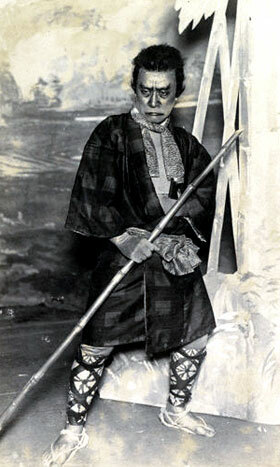 "Ogurusu no Chôbê" is a 1-act (1 scene) drama. At the village of Ogurusu's tea house, a group of farmers are talking excitedly about the battle of Yamazaki, which happened not too far away the previous day. The general Akechi Mitsuhide was defeated by his rival Hashiba Hideyoshi. The farmers are joined in their discussion by old Chôkurô. He is accompanied by his daughter Oine and his son-in-law Shichinosuke. The old man is congratulated for this fine couple. But they all agree that they can't say the same thing for Chôkurô's son Chôbê, who is Ogurusu's black sheep. The umakata Yatahachi comes by in a very bad mood. He tells them that good-for-nothing Chôbê stole his horse the previous day. Chôkurô should compensate Yatahachi for his loss as he can't work without his horse. Chôkurô is forced into agreeing to compensate but he will have first to sell his small land plot to gather the money. At his point the village shôya Yomosaku comes to the scene with the village temple's oshô Hôzen. Yomosaku informs the farmers that the victorious general Hashiba Hideyoshi has posted a notice ordering villagers not to take advantage of the post-battle chaos. Just as the others are exclaiming in fear at the injunction, the hunter Denzô comes with his teppô. He confesses to the shôya that he had seen a straggler of the defeated army. The escaping warrior was wearing a fine armor and Denzô has shot at him to steal it. Fortunately, he had missed the warrior and then fled in terror. When he hears about Hideyoshi's official order, he begs the shôya to save him. Yomosaku, noting that Denzô has not inflicted any harm and that there was no witness at the scene of the crime, enjoins everyone to keep quiet about the story. Now Chôbê comes on the scene, roughly pulling along Kosuzu, the Ogurusu shrine maiden. He is in a bad mood, saying he had taken his bamboo spear (takeyari) and gone to loot the dead or attack the wounded. He tried all night at it, but none of his victims had anything of value with them. While going home, he has got hold of the shrine maiden and is now demanding that the tea house proprietor bring out drinks. He plans to force the maiden to serve him some sake. Both Yomosaku and Hôzen remonstrate with Chôbê but he continues to make himself even more obnoxious. Yatahachi accuses Chôbê of having stolen his horse the day before. He has located his horse at a neighboring village where Chôbê had sold it. He can therefore produce a witness to prove Chôbê's bad deeds. Chôbê refuses to admit that he is guilty. When the farmers start to admonish him too, he grabs Denzô's teppô and threatens them with it. Chôkurô can't stand it anymore. He decides to disown his unruly son with the shôya as witness. A huge ramble starts and Chôbê shoots at random a couple of time. Unfortunately for him, one of the shots wounds his father. The villagers all jump on Chôbê, tie him up in a straw mat, and decide to dump him in the river. Horio Mosuke Yoshiharu, one of Hashiba Hideyoshi's retainers, arrives on stage. He has brought with him the bloodstained tip (yarisaki) of a bamboo spear. He asks the villagers whether they know of one of them who went off to loot with a bamboo spear the previous night. The villagers, mindful of Hideyoshi's official order, reply that they don't know anything at all. Horio Mosuke then explains the circumstances. He says that Akechi Mitsuhide was stabbed with a bamboo spear, the weapon of a farmer, not of a warrior. Mitsuhide succeeded in cutting off the tip of the spear, but being mortally wounded, subsequently committed suicide. Hashiba Hideyoshi is now seeking the man responsible for the death of Mitsuhide to offer a generous reward. A muffled voice coming from the bundled-up Chôbê is heard. He tells Horio Mosuke that he is the man in question, and that the now tipless bamboo spear discarded somewhere nearby should prove his story. The villagers search and find the bamboo stick which fits the sliced-off tip perfectly. Chôbê is released from his bonds, and is promised a handsome reward. After Horio Mosuke has departed, the villagers surround Chôbê admiringly, saying that he is indeed the number one man in this village (mura no ichiban otoko in Japanese). The old Chôkurô is now proud of his son. 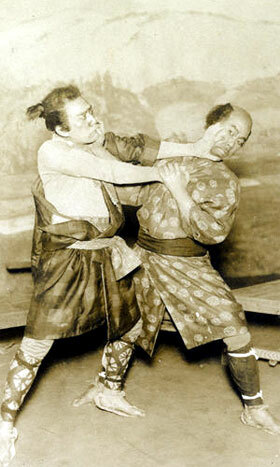 The actors Ichikawa Ennosuke II (left) and Bandô Jusaburô III (right) playing the roles of Chôbê and the umakata Yatahachi in the drama "Ogurusu no Chôbê"
The actor Ichikawa Ennosuke II playing the role of Chôbê in the drama "Ogurusu no Chôbê"